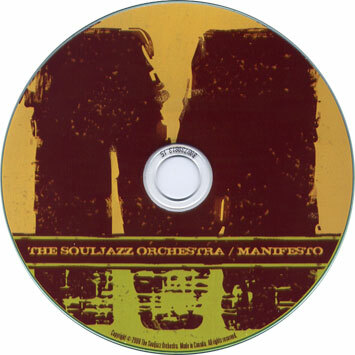 Yes, the rumours are true: the Souljazz Orchestra is releasing a new album, entitled Manifesto, on September 23rd 2008, once again through Do Right! Music. This one blends the heavy afro-sounds of Freedom No Go Die with a good dose of tropical highlife, dirty funk, and big band jazz. A 7" vinyl single, featuring two of the tracks on the album, will be coming out ahead of time, in July: look out for that. Our summer tour is just about finalized: we'll be hitting England, Scotland, Austria, Hungary and Denmark for the first time, returning to France once again, and of course doing a few shows in Canada as well. Highlights: playing Bayonne with Erik Truffaz, performing Joe Zawinul's Birdland in Vienna, hitting the Cargo in London, playing the Big Chill in Hereford with fellow Canadian Leonard Cohen, sharing the Fiest'A Sète stage with the likes of Charles Walker, Gwen McCrae, Kid Creole, and Éthiopique legend Mahmoud Ahmed. The Souljazz Orchestra's debut album on the Do Right! label, "Freedom No Go Die", has come to receive rave reviews from critics and fans alike, its lead-off track reaching the Top 10 of the Year on Gilles Peterson's BBC Radio 1 Show, as voted by the listeners. "Freedom No Go Die" also became one of the biggest selling afrobeat albums of the year in France. It has been featured on numerous compilations and has managed to climb charts not only at home but abroad as well. Since the release of "Freedom No Go Die", the SJO has been tirelessly touring the festival circuit across Europe and Canada, amassing quite an international following. The band now returns in full force with their new album "Manifesto". Building on the success of their previous effort, the SJO has upped the ante with this latest album. "Manifesto" reflects the various influences picked up from the band's travels across the globe, making for a uniquely rich array of sounds. Their powerful chants, majestic brass, overheated organs, chicken-scratch guitars, hypnotic bass and poly-rhythmic percussion work mix tropical funk and spiritual jazz to the band's signature militant afrobeat. The Souljazz Orchestra also cast their net wider with this latest effort, delving into the traditions of ancient folk tales and spirituality, while keeping their message politically conscious. Now in their 7th year as a band, the multicultural collective from Ottawa has had the honour of sharing the stage with the likes of Femi Kuti, Etta James and Sharon Jones & the Dap-Kings. They have performed to crowds in venues around the globe, including France, England, Scotland, Denmark, Austria, Hungary and the United States. 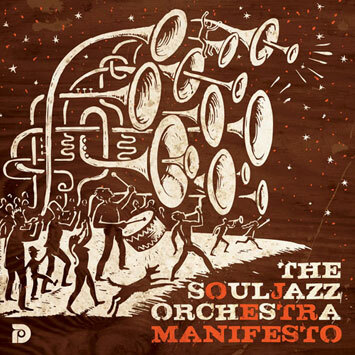 "Manifesto" is the fruit of the Souljazz Orchestras relentless touring, containing songs that have developed organically over the course of hundreds of live performances.